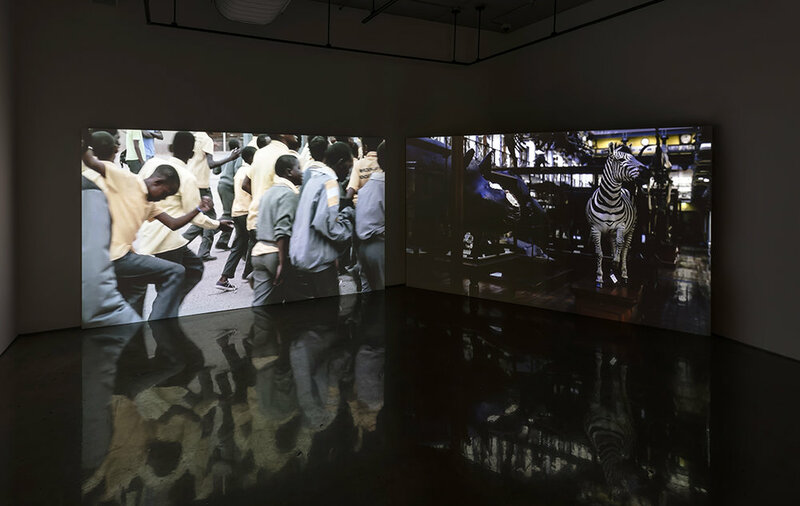 A Poetic Truth in a Pathetic Fallacy (2-channel video) considers ways in which human-kind has been fascinated by and has misinterpreted the rhinoceros, exploring the urgency to keep this genus from extinction while considering the lingering effects of colonialism and collection. Over the past decade the trafficking of rhino horns has gained popularity and both poaching and theft of vintage horns has risen dramatically. Horns were traditionally used in Eastern medicine and although scientists have concluded they have no health benefit, this has not dissuaded the market and its value has risen due to its newfound status as a luxury good. This is not the first time that the rhino has been misconstrued. In 1515 Albrecht Dürer created his famous woodcut based on a written description of the rhinoceros. Although grossly inaccurate, his artwork served as the prototype for future depictions of rhinos up until the mid-19th century. In South Africa today, the lingering effects of colonialism and apartheid are at the root of poaching. In the male-dominated industry of wildlife protection the Black Mambas [all female] Anti-Poaching Unit have gained international recognition for their efforts. Although beloved by the media, the Mambas risk their lives and struggle to support their families while protecting the wildlife that serves the financial interests of white landowners. 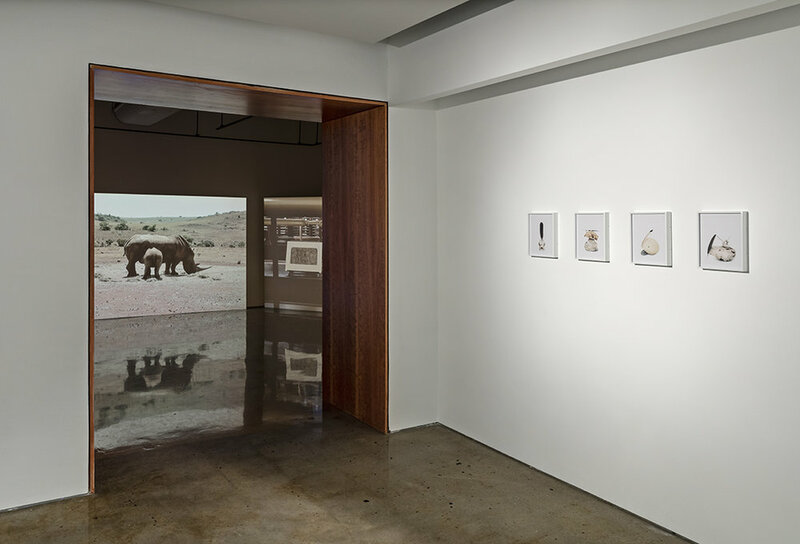 This project is a multi-layered investigation into the link between globalization and extinction, using the rhino as a stand-in to speak about the relationship between bodies, labour, desire and misconception. A Poetic Truth in a Pathetic Fallacy was made with the generous support and assistance from the Canada Council for the Arts and the Jerome Foundation. Special thanks to the Black Mambas Anti-Poaching Unit, the National Museum of Ireland - Natural History and the Department of Prints & Drawings at the British Museum for providing access for filming. This work was made on artist residencies at the Nirox Foundation, the Irish Museum of Modern Art, the Lower Manhattan Cultural Council's Workspace program, and the NARS Foundation.